It's hard to see but it is raining quite hard. 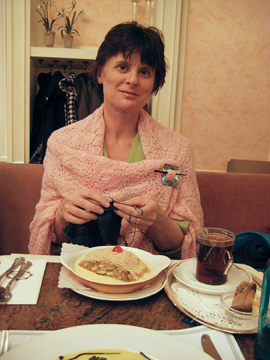 More comfort with eating and knitting! 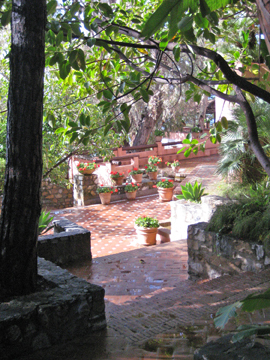 Finally, the sun broke through on Friday! We had most of the day to take Roop and Rashme for a quick day trip into the hills before we had to take them to the airport. 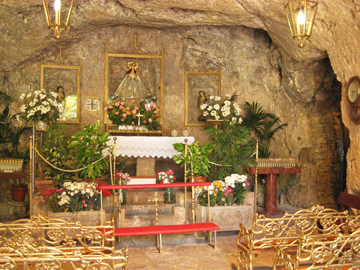 We found a stunning little church dug into a cave in the 1600s. 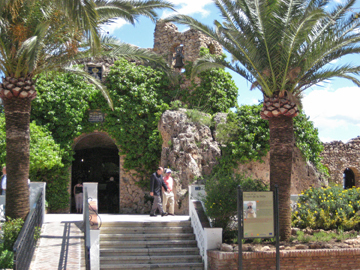 The day flew by and before we knew it, we needed to leave for the airport. That left three days for Bob and I to explore the area on our own. Ok, we have to start with this photo because it is my favorite from the entire show! 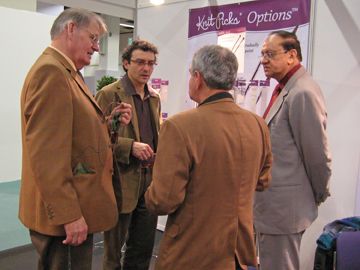 Bob and Roop are on the right but I couldn't tell you anything about the other two gentlemen. All I know is that the one fellow had grabbed a pair of needles and was trying them out. No problem except that he started walking around as he talked with Bob and Roop. 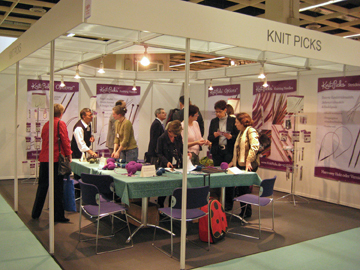 Before we knew it, we had quite a tangle of yarn all over the booth. I straightened out, identified the ball of yarn that was attached to his needles and stuffed it into his pocket. I couldn't resist taking a picture! When things started slowing down in the afternoon, Astrid tried to help me knit faster. It felt like I was learning to knit all over again. I remember the details but I haven't taken the time to sit down and build up the muscle memory. 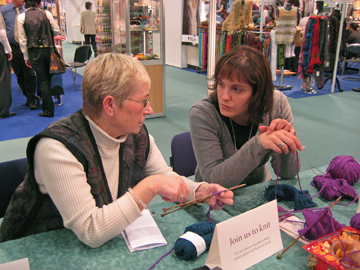 It all has to do with tiny movements and grabbing the yarn at the very tips of the needles. Before we broke down the booth, we had a group photo taken. Tired but very happy! 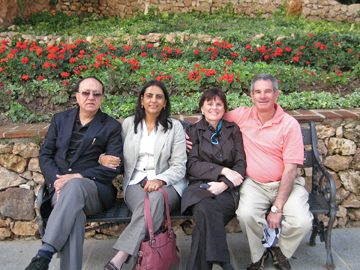 Roop, me, Bob, Rashme, Astrid, Angela and Ashok. 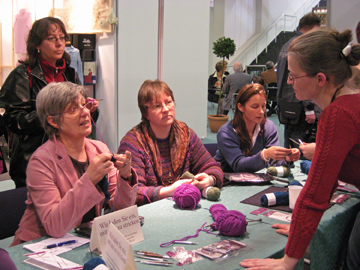 One of the big surprises at the show, for me, was having internet friends drop by to say, "Hi". Lena, from Ravelry, came bearing gifts! Apple wine and hand-made stitch markers. 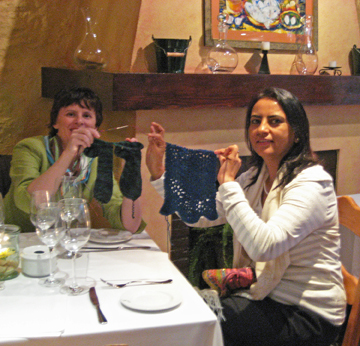 Elemmaciltur, from the podcast, Knitter's Uncensored, saw that we had visited Daniella's shop on Wednesday. 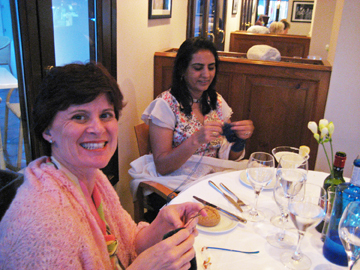 Of course, we had lots of knitters trying out the needles! Astrid is busy answering questions! It was a lot like a big party! 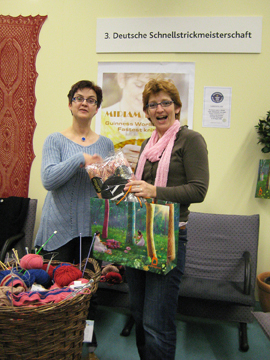 After spending the day with us, Angela went off to try her hand at being the fastest knitter of the day! 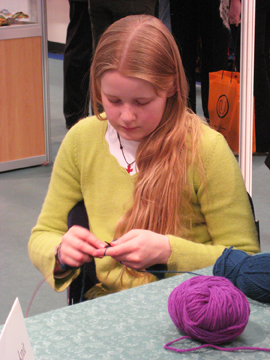 On Sunday, she won Fastest Knitter in Germany!! Of course, Bob just loved all the activity! And, kissing our first order! 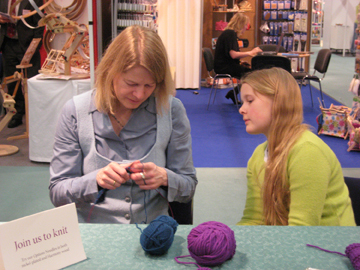 I loved seeing so many happy knitters sitting down and enjoying our needles. I've taken up a new challenge! 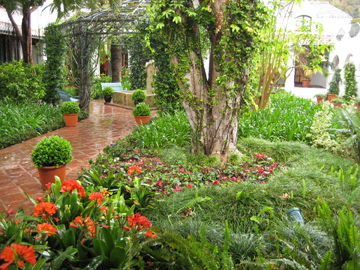 Last month I read an absolutely wonderful mystery called The Flander's Panel by Arturo Perez-Reverte. The plot revolves around a mysterious chess match. 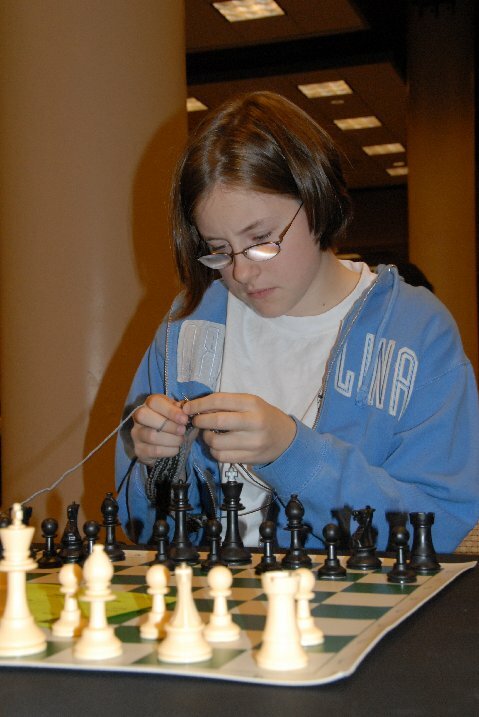 I learned how to play chess when I was a little girl but never really took it seriously. This book convinced me that chess would be a good way to sharpen my wits. 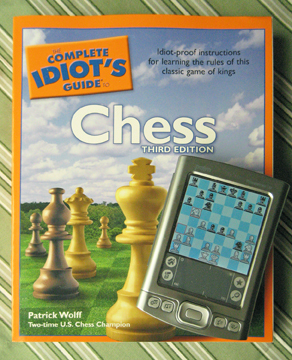 So I downloaded a game program onto my Palm and ordered The Complete Idiot's Guide to Chess. I also sent a note to a friend whose children are on their school's chess team asking for advice. You won't believe what she sent to me! It turns out that Emily has learned that your opponent becomes completely rattled when you finish your move and then pick up your knitting as you wait for him to make his move! First Day of the Cologne Show! Ok, talk about the classic differences between men and women! 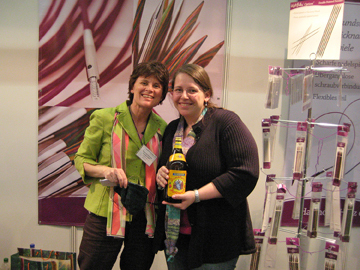 Angela and Astrid are two ladies who sell our needles in Germany. They agreed to come and help us in the booth during the show. The arrived on Wednesday night and we got together to plan for Thursday. The show would be opening at 9:00. The women wanted to leave for the show at 8:15, the men wanted to leave at 8:45! Thankfully Ashok couldn't take all of us in one trip so the women left when they wanted and the men dragged along later. Bob was convinced that we wouldn't see many people before 10:00. Well, here is an example of what our booth looked like just before 9:00 as we waited for the starting bell. 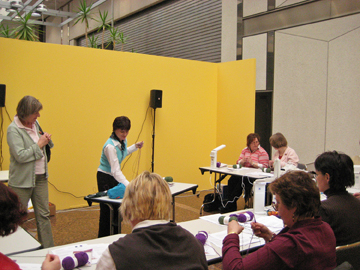 I taught a class in the afternoon for knitting two socks at the same time on one long circular needle. It went pretty well given that Angela had to translate everything for me. We were all on our feet all day long. Ashok kept bringing us cups of coffee to keep up our energy. It was so wonderful to see knitters enjoying the needles! 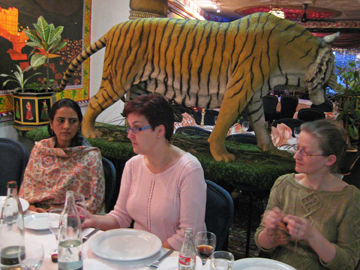 By the end of the day we were all more than ready for some Indian food and a good night's sleep! I'm so glad to be home!! Thanks to late season snow this weekend, I was able to completely indulge in being back home! I read a delightful new book that I had bought right before we left for Europe. I didn't have time to start reading it before the trip and decided to leave it behind. So, Saturday morning, I started the fire in the fireplace, made a cup of tea, grabbed a heating pad to keep my toes toasty warm and started knitting a baby blanket for my niece, Seana. She loves sunflowers and seems to be subconsciously transfering that preference to her choice of colors for her new baby. 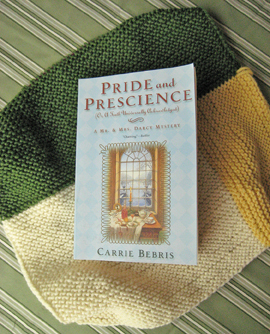 Since my favorite Moderne Baby Blanket is just knit in garter stitch, I'm able to read and knit at the same time! What a perfect weekend! 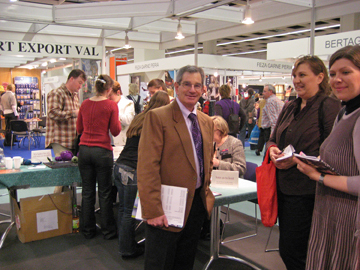 The trade show in Cologne was an overwhelming success!! I took many, many photos which is why it has taken several days to get everything organized. Rather than overwhelm you with the whole thing at once, I plan on spreading the experience out over a few blogs. We arrived in Cologne on Tuesday, April 1st. Lufthansa flies directly from Portland, Oregon to Frankfurt so all we had to do was catch a train to Cologne. It turns out that socks were the perfect choice for this trip. I spent most of the flight listening to Pillars of the Earth while I knit round and round and round. And, of course, asked the flight attendant for more water every chance I got. Our hotel in Cologne was literally just across the cathedral square from the train station. Talk about convenient. We took some time unpack because I knew the surge of "arrival" energy would disappear quickly and we would crash. After a short walk, Bob and I took a nap and then met Roop, Rashme and Ashok for a simple dinner. Roop is the owner of the company that makes our Options needles, Rashme is his friend and Ashok is Roop's cousin. 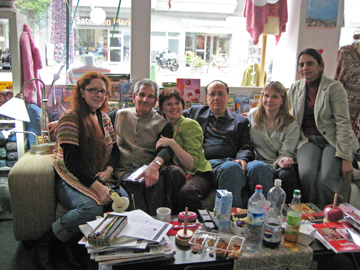 Ashok has lived in Germany for over forty years so he was extremly helpful. And, he had a car to shuttle us back and forth between the hotel and the convention center. Wednesday morning we woke up around 8:00 and headed down for breakfast. 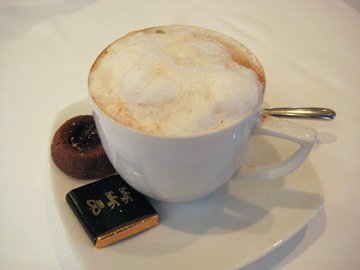 What I love most about traveling in Northern Europe are the breakfasts. Sturdy, filling food that really gets you through the morning. 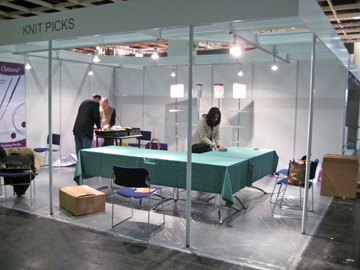 Which was a good thing because we had to get the booth set up and ready for the show to start on Thursday. 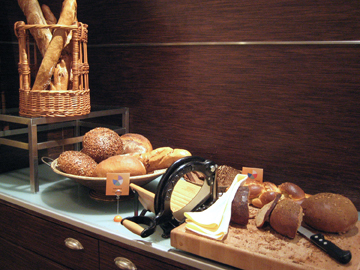 My favorite breakfast items are the hearty breads. Then, we were off to the Convention Center! 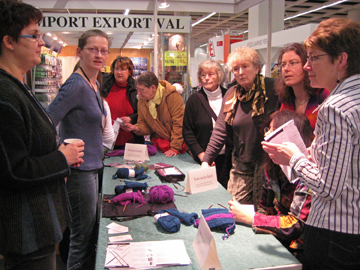 This was my first trade show so I was ridiculously excited and very worried about how the Options Needles would be received. 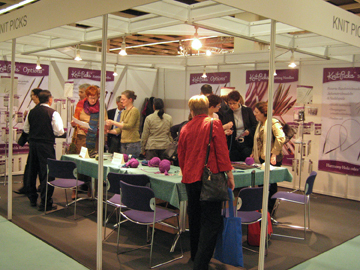 The booth certainly looked bare when we arrived!! Time to get to work! 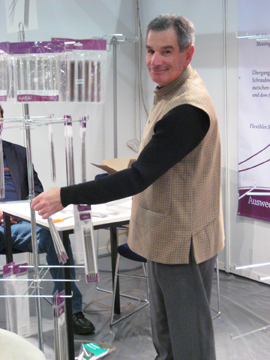 Ashok unpacked the display units for the needles. 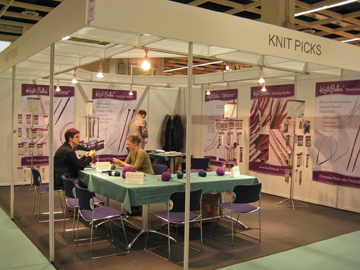 Rashme and I set up the "knitting" tables. 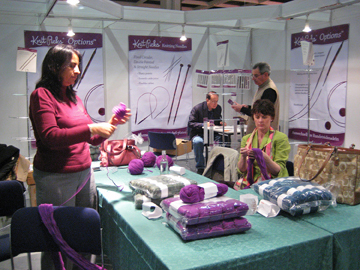 Bob and Roop got all the yarns, needles and handouts organized. 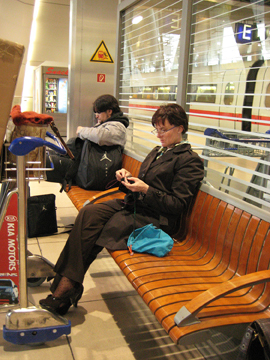 The plan was to have a nice place for knitter's to sit down and try out the Options needles for themselves. We would have several 24" needles all ready with yarn. I shipped some Wool of the Andes worsted and some Cadena so we could show how easy it was to switch from small needles to bigger needles depending on the yarn. My tactical error was that I forgot Cadena comes in skeins rather than balls. So Rashme and I had to spend a chunk of time balling up a couple of skeins to be ready for Thursday. Roop and Rashme brought Bob and I gifts. I received a lovely silk shawl and matching purse. Bob got a Nehru style vest that actually turned out to be very useful since the weather was cold in Cologne. I think he looks very good in his vest! After three hours, we were satisfied with the booth. Time for some food! I had a craving for apple streudal and Bob and I had seen a very nice cafe on our walk Tuesday afternoon. 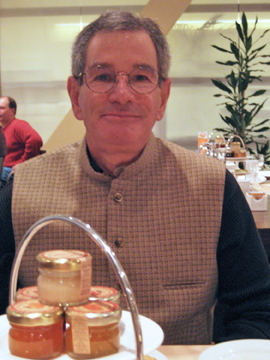 Ashok explained that apple streudal was even better slathered with warm custard sauce. With a cup of hot tea, I had a perfect lunch! With full tummies, we headed off to visit a local knitting shop that carries the Options needles. Oh, I can't tell you how nice it felt to walk into a fiber haven complete with a comfy sofa! Daniela (on the left) said we could stay as long as we wanted but I didn't think she really wanted a snoring, jet-lagged American stretched out in the middle of her shop. So, we headed back to the hotel for a much needed nap! Whew, that was a busy day!